North 1 mi. out of Roulette on Fishing Creek Rd. Turn left at the Y onto the West Branch. Cemetery is on the right about 2 miles. Lots in Clara Township are 20' X 20' - Lot # 1 - 27. 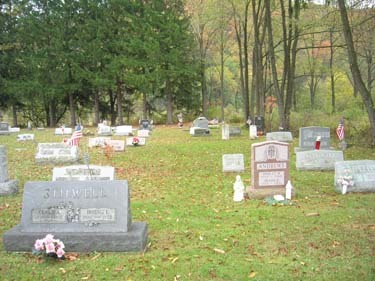 The Clara portion of the cemetery was given by Benjamite Albert Greene. The Roulette portion of the cemetery was given by Edward Brown. 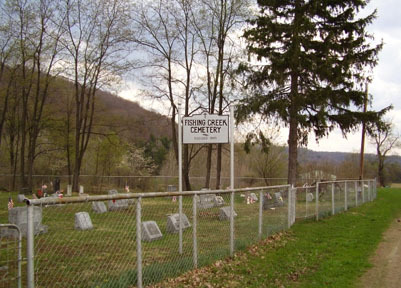 Tony Gross is buried south of the boundry of the cemetery on land he owned. Later owned by Robert & Anona Greene. This was orginally owned by Fredrick Yentzer. BLACKWELL, George W. Spouse of Vada Tauscher. Born 6-12-1918, died 5-10-2009. Age: 91 - Son of Charles and Esther (Campman) Blackwell. Born in Blossburg PA, worked 30 yrs for North Penn Gas. Wed 10-4- 946 in Roulette, two children. BLACKWELL, Vada V. (Tauscher). Spouse of George W. Born 12-18-1929, died 2-14-2004. Age: 83 - Dau of Carl and Hester (Beebe) Tauscher. Born in Roulette, a beautician. Wed 10-4- 946 in Roulette, two children. CAULKINS, David D. Born 11-11-1942, died 4-6-2012. Age: 69 - Adopted son of Lynn G. and Louise V. (Thielges) Caulkins. DRABERT, Olive (Bryington) *. Spouse of W. Howard. Born 9-8-1922, died 6-24-2006. Age: 83 - Dau of Warren A. and Kathryn (Thompson) Bryington. Born in Galeton, a secretary. Wed 9-2-1939 in Roulette, 4 children. DRABERT, Patricia R. (Bigley). Spouse of Donald. Born 12-3-1938, died 11-16-1009. Age: 70 - Dau of William Harry and Ruth Esther (Goodman) Bigley. Wed 6-23-1962, two children. FESSENDEN, Maxine (Tauscher). Spouse of Robert. Born 8-18-1918, died 10-3-2003. Age: 85 - Dau of Carl and Hester (Beebe) Tauscher. Born in Roulette, a secretary and bookkeeper. Wed 10-4- 1946 in Roulette, three children. KNIGHT, Richard Murle. Spouse of Josephine McAfee. Born 3-1-1932, died 12-30-2011. Age: 79 - Son of Murle D. and Grace E. (Church) Knight, born in Olean NY. Wed 8-13-1955 in Port Allegany PA, three children. NOLDER, Agnes L. (Caulkins). Spouse of Edward V. Born 10-19-1929, died 4-18-2016. Age: 86 - Dau of Lynn and Louise (Thielges) Caulkins, born and lived in Roulette PA, died in Coudersport PA. Wed 8-25-1951 in Roulette, two sons. VOTA, Frances Louise (Caulkins). Spouse of David Gray/ Walter Perkarski/ Anthony Vota. Born 3-18-1927, died 12-13-2008. Age: 81 - Dau of Lynn G. and Louise V. (Thielges) Caulkins. Wed David, 3 daus. Wed Walter, 1 son. Wed Anthony 2-14-1981 in Leechburg, PA.